From U.S. 80 East/West, take US Highway 14 to Earl Goodwin Parkway. The mall is on the corner of US-14 and Earl Goodwin Pkwy. 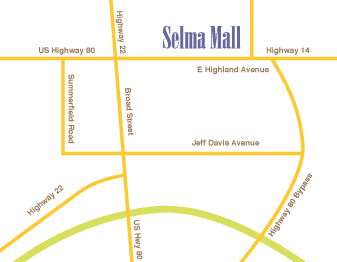 Selma Mall is the IN Place to shop for Selma, Alabama. With a unique selection of fashions, gifts and accessories, find the largest collection of your favorite stores all under one roof.